Likud Minister urges PM to seriously consider Yisrael Beytenu's conditions to join the coalition, instead of Zionist Union. Immigrant Absorption and Jerusalem Affairs Minister Ze'ev Elkin (Likud) on Wednesday issued a call to Prime Minister Binyamin Netanyahu, urging him to look into Yisrael Beytenu chairperson MK Avigdor Liberman's conditions for joining the coalition government. In a press conference on Wednesday held on the backdrop of Netanyahu's efforts to form a unity government with the leftist Zionist Union that is demanding a unilateral division of Jerusalem, Liberman listed his conditions as: the defense ministry, the imposition of the death penalty for terrorist murderers, and pension reforms. Shortly afterwards Netanyahu invited his former ally and Foreign Minister Liberman for a meeting, apparently to discuss his conditions. 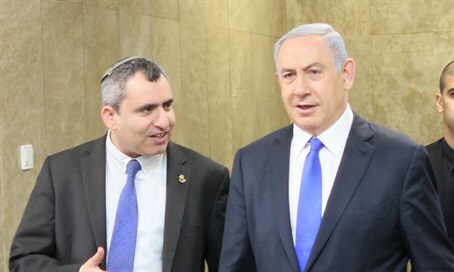 Before that meeting was called, Elkin called on Netanyahu "to seriously check the possibility of expanding the government through accelerated negotiations with Yisrael Beytenu." "It is better to build a stable government of the nationalist camp according to what we promised the voters, than to go establish a bogus unity government, which won't be stable and will harm Likud and Zionist Union as well as the confidence of the Israeli public in the political system." His call hearkens to Likud's campaign slogan in elections last year - "it's us or them" - in which it attempted to separate itself completely from its leftist rival Zionist Union, which is a combination of Labor and Hatnua. Elkin's warning about public confidence echoes comments by Interior Committee chairperson MK David Amsalem (Likud), who earlier on Wednesday stated that the public hates politicians because they lie and warned a unity government with Zionist Union would turn Likud's campaign promises into a "lie."